The gorgeous dreams of gold and empire which filled the minds of the explorers of the 16th century slowly faded into the sober realization of the hardships involved in settling the wild and distant regions of the New World. To the romantic age of discovery succeeded the practical age of colonization. 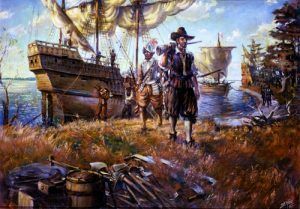 The motives which led thousands of Europeans to leave their homes in the 17th century and brave the storms of the Atlantic Ocean to settle on the shores of the James, Charles, Hudson, and St. Lawrence Rivers, were those which have prompted migration in every age; namely, the desire to get a better living and the desire to enjoy a fuller freedom. Now it happened that both these desires were greatly stimulated by the events of the sixteenth century in Europe. In the first place, the masses of the people, who had lived as serfs on the great feudal estates of the nobles in the Middle Ages, were finding more and more diversified employment as citizens of national states — artisans and mechanics in the towns, free tenant farmers, merchants, and traders. In other words, a middle class was emerging and was beginning to amass money. At the same time the military and civil expenses of the kings, whose responsibilities were growing with their states, made taxes high and land dear. The limitless virgin lands of the New World offered a tempting relief for the hard-pressed. In the second place, large parts of northern Europe had broken away from the ecclesiastical authority of the Roman Church in the sixteenth century, in the movement known as the Protestant Reformation. State churches were established in England, Germany, Scandinavia, and the Netherlands, with the rulers in authority instead of the Pope; and dissent from the doctrine of these established churches were treated, not only as religious heresy but also as political treason. But, the spirit of free inquiry and religious innovation which had destroyed the unity of the Roman Church could not be held in check by rulers. Men claimed individual freedom of belief and worship. A great variety of religious sects appeared. Kings and princes tried to reduce them to submission, and the persecutions in Europe sent many refugees as colonists to the New World. From the 17th to the 20th century the tide of immigration flowed from Europe to America until, by the earl1900s, less than half the population of the United States was native-born with native-born parents. Yet, these immigrants did not transport the political and social institutions of their own lands to the United States, but, instead, with remarkable rapidity, adopted the speech, customs, and ideals of America. For although Spain and France held or claimed by far the largest part of North America, while the English settlements were still confined to a narrow strip along the Atlantic coast, nevertheless those English settlements absorbed all the rest in their spread to the Pacific and made the English civilization — English speech, English political ideals, English common law, English courts and local governments, English codes of manners and standards of culture — the basis of American life. 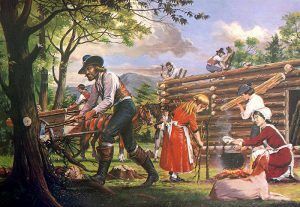 We severed our political connection with England by the American Revolution, but we could not lay aside the culture or destroy the institutions in which our forefathers had been trained for centuries. We still remained the daughter country, though we left the mother’s roof and set up our own establishment. Queen Elizabeth’s long and glorious reign came to an end in 1603, when she was succeeded on the throne of England by James Stuart of Scotland. In the year 1606, King James gave permission to “certain loving subjects to deduce and conduct two colonies or plantations of settlers to America. 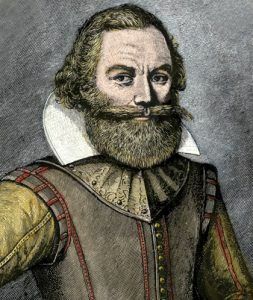 The Stuart king began his reign with a pompous announcement of peace with all his European neighbors; consequently, though England claimed all North America by virtue of Cabot’s discovery of 1497, James limited the territory of his grant so as not to encroach on the Spanish settlements of Florida or on the French interests about the St. Lawrence River. The powers of government bestowed on the new companies were as complicated as the grants of territory. The companies were to have a council of 13 in England, appointed by the king and subject to his control. This English council was to appoint another council of thirteen members to reside in each colony, and, under the direction of a president, to manage its local affairs; subject always to the authority of the English council, which in turn, was subject to the king. 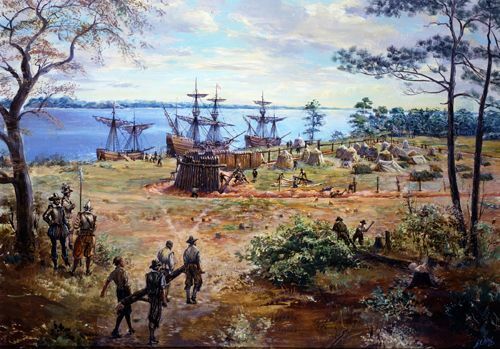 In May 1607, about 100 colonists, sent out by the London Company, reached the shores of Virginia and sailing at some miles up a broad river started a settlement on a low peninsula. They named the river and settlement James and Jamestown in honor of the king. However, the colony did not thrive. The charter provided that the harvests should be gathered into a common storehouse, and then dispensed to the settlers, thus encouraging the idle and shiftless to live at the expense of the industrious. Authority was hard to enforce with the clumsy form of government, and the proprietors in England were too far away to consult the needs of the colonists. Exploring the land for gold and the rivers for a passage to Cathay proved more attractive to the settlers than planting corn. In addition, the unwholesome site of the town caused fever and malaria. Had it not been for the almost superhuman efforts of one man, Captain John Smith, the little colony could not have survived. Smith had come to Virginia after a romantic and worldwide career as a soldier of fortune. His masterful spirit, at once, assumed the direction of the colony in spite of its president and council. 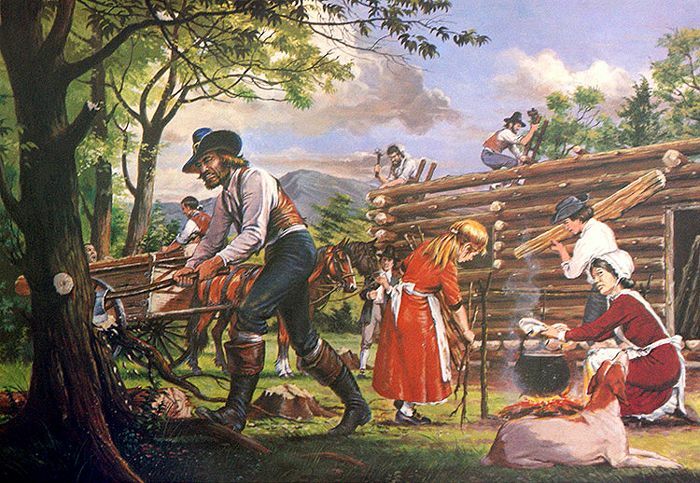 His courage and tact with the Indians got corn for the starving settlers, and his indomitable energy inspired the good and cowed the lazy and the unjust. In his vivid narratives of early Virginia in 1624, he gave himself and his services to the colony full credit, for he was not a modest or retiring man. But his self-praise does not lessen the value of his services. In the summer of 1609, he was wounded by an explosion of gunpowder and returned to England. The winter following Captain John Smith’s departure was the awful “starving time.” Of five hundred men in the colony in October, only 60 were left in June. This feeble remnant, taking advantage of the arrival of ships from the Bermudas, determined to abandon the settlement. With but a fortnight’s provisions, which they hoped would carry them to Newfoundland, they bid a final farewell to the scene of their suffering and dropped slowly down the broad James River. But, on reaching the mouth of the river they spied ships flying England’s colors. It was the fleet of Lord de la Warre (Delaware), the new governor, bringing men and supplies. 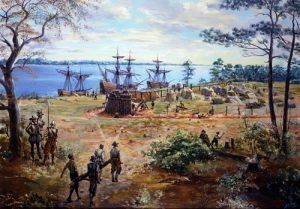 Thus, narrowly did the Jamestown colony escape the fate of Raleigh’s settlements. De la Warre brought more than food and recruits. The London Company had been reorganized in 1609, and a new charter granted by the king, which altered both the territory and the government of Virginia. Henceforth, a large and rich corporation in England was to conduct the affairs of the company, without the intervention of the king. Virginia was to have a governor sent out by the company. Under the new regime, the colony picked up, Order was enforced under the harsh but salutary rule of Governor Dale. The colonists, losing the gold fever, turned to agriculture and manufacturing.